If a Japanese woman were to compliment a friend on her flattering pale-blue blouse, she'd probably employ a word with no English equivalent. Azure. Cyan. Aqua. We just don't use them very often because it's so simple to use an adjective to modify "blue", like light blue, sky blue, dark blue, royal blue, navy blue, and people easily grasp the general idea. 2 syllables - light blue. easily said. highly convenient, as many syllables as mizu. both terms are equally convenient. new words arise because of their usefulness and figurative style. 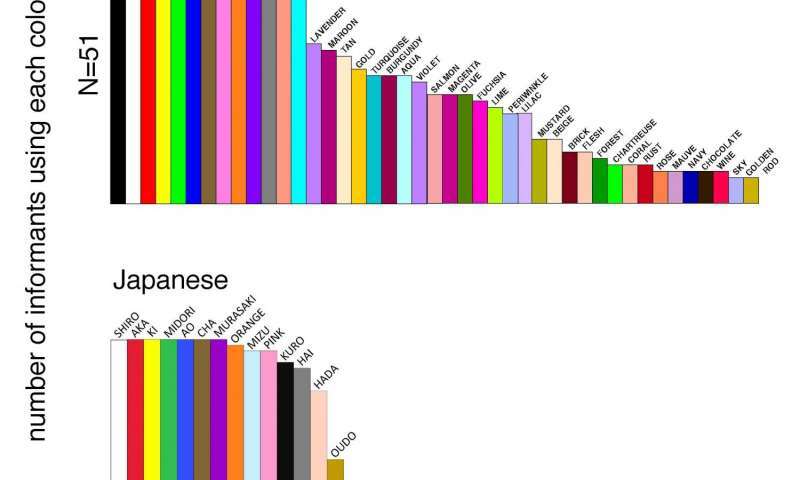 "People around the world have very different color-naming systems and that raises interesting questions about what we're born with and what's strongly contingent upon our culture,"
Ya know...could it be that the Japanese have a color association with 'water' becauseJapan is - hold on to your hats - a set of friggin' islands? And everyone and their dog has first hand experience - on an almost daily basis - of what large expanses of water look like? people tend to associate colors with stuff they know intimately. I'm not sure why I would be expected to be surprised that two distinct cultures with two distinct languages would not be different in an area that is so subjective. The ancient Greeks didn't have a word for blue as we understand it and they are an island nation. In the iliad Homer describes the sky as bronze and the sea as wine - no mention if he meant white or red! The word that they used for light blue, glaukos, seems to be a shade rather than a specific colour as it seems to also get used for pale green, grey and even yellow. The ancient Greeks didn't have a word for blue as we understand it and they are an island nation. I think Aqua fits the bill pretty accurately, and the point about Syllables is true as well. We say light blue, dark blue and blue because the difference is fairly dramatic between shades of blue. But necessity is the mother of word invention, and I'm sure anyone who needs to use a single word to describe colors, like someone who works in a Paint store, will adopt more efficient words for colors as quickly as needed. The only reference I can find for ceruleum (caeruleum) is in Ovid's metamorphoses which is in latin and refers to Trition rising from the waves and makes me think this is a reference to water than a specific colour. Caeruleum would appear to derive from Caelum, vault of heaven, which was turned into the English word Cerlean or Caerulean which was used as a descriptive for blue/cyan colours. If you have a greek etymology I would be very interested. Ok I understand now, I think Kyanos means dark rather than specifically blue and was used to describe colours from dark blue to black even dark green was sometimes called Kynaos. In the iliad Hector, son of King Priam, is described as having hair that was Kyanos, whilst it's not impossible that he had blue hair it was most probably meant to describe a lustres black. Holy crap! You discovered a new color! Better let these scientists know about it!